At this time of year, we remember those who fought and died for the freedoms we enjoy today – but it is also the start of the University term for our new young researchers. 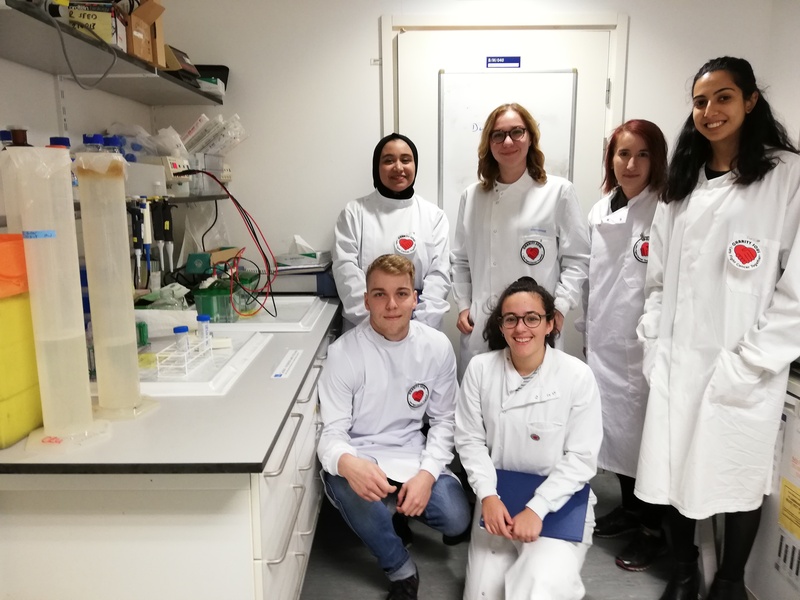 This year the projects, which only run because of the generous donations from Charity Soul, were more popular than ever, and we ended up with 6 young aspiring researchers packing out my laboratory. In fact, there were a number of disgruntled unsuccessful applicants who made their disappointment very clear. If you can remember, last year’s students achieved all that we set them and we now have quite a number of cells whose cancer-causing genes have been edited. The task for this year’s students is to sort through all of these to find the best ones for further study. In this they will be aided by a fully qualified scientist Dr Dominika Butler, and for a time another of my research students, Leanne Archer. We are now on to the second phase of the work, snipping out a second gene to see how close to cancer we get. I have arranged that we will work with the University of Cardiff to provide a test for the ability of the cells to actually cause cancer, so everything is moving forward at a greater pace than before. By next spring I aim to know which of the 20,000 genes in each human cell are affected. As ever our new group of students have it all to learn, but if last year’s crop is anything to go by, then the experience they gain will be a major selling factor in their choice of post-graduation jobs. In fact, several of the last groups of Charity Soul students have been in contact to say how much they already miss the support and the excitement of their research experience in York! But research does take time, and time is something which is running out for me personally. This year I have been in hospital 3 times, and although my health is (almost) restored I have decided that I will retire from York, after 28 years, and after more than 45 years in Cancer Research in August next year (2019). This was a difficult decision to make, but there are a number of contingency plans for my research, which I hope will come to fruition soon. Until next year however, I have set a lot of goals, and in fact I am probably busier than ever. I know you have been so supportive of my lab for many years now, providing £60,000 which I could not have dreamed of, and the opportunity to try some new approaches to understanding cancer and stem cells, and it my hope that this work will continue, but perhaps not in York. Research (or at least good research) really does take time, and this is best illustrated by a paper we published last month in the British Journal of Cancer. The laboratory work was done back in 2012-13, (before Charity Soul first contacted us), and was supported by Masonic Charities. So at least 8 years from the idea to the result. We, and here I mean another young Italian colleague, Dr Davide Pellacani and I, wanted to understand the triggers which caused cells to change properties – a process called differentiation. Differentiation in tissues starts with a stem cell. We thought that the main actor in this drama was a process known as epigenetics. To study differentiation we had to push the boundaries of gene sequencing with a company in California, and generated more than 16 million pieces of information from every patient. At the time the software to analyse this information was not available and it was only in the last 2 years that we were able to make the most of this data. Given the complexity, there were a number of conclusions in our paper, but the one with the most relevance to the general public was the realisation that our analysis could diagnose cancers in over 500 tested patients with a certainty of 96%. For prostate cancer the currently used PSA test is only 70-80% effective. When we pushed the analysis even more, it told us that we could tell those patients whose cancer was going to spread, from those whose cancer would remain in the prostate. This has been called the ‘Holy Grail’ of cancer diagnosis. However, we are not all the way there yet, as our efficiency is only at 76% – so there is more work to do. But we are still 76% better than almost every other test! Without our stem cell-based approach this would not have been possible. We hope now to work with diagnostics companies to see whether our test could be developed to benefit patients as soon as possible. The pictures below are graphs of the data showing just how much better our new test could be compared to PSA. Look at how all of the cancers (purple) are clustered together after the test is applied!